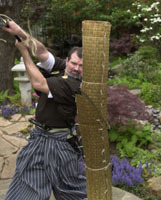 Tameshigiri is cutting practice with the Japanese sword. From a classical perspective it is a part of the kenjutsu curriculum so that the student confirms that their cutting motions are correct and acquires actual experience in using the sword to cut. In modern application the primary targets are soaked goza and bamboo. Proper application of the sword in cutting teaches practical function. The student learns how much pressure to apply to cut different objects, rapid multiple cutting with proper angle of attack of the blade and controlled follow through, and how impact affects the blade. Mental concentration is improved and at higher levels of skill and understanding the student comes to realize that it is the mind that does the cutting.